I am taking an example of a text box that will suggest city names from a list of cities according to inputs entered by user. Suggestions displayed are list entries that start with the string given as input. The maximum display limit of suggestions will be 10. The list of suggestions should be displayed in ascending alphabetical order. 1. Enter 1 character in the autosuggest field for which values are not present in the auto suggest list. >> Suggestion list should display only 10 out of the 11 available cities. >> Suggestion list should display all the 10 available cities. >> Suggestion list should display all the 9 available cities. 5. Enter 1 character in the autosuggest field for which count of values present is exactly 1. For example, there is only one city that has its name starting with “Y” in our database. >> Suggestion list should display the city name that starts with “y”. >> If records are displayed, the input string should be highlighted in the records that are displayed in the suggestion list. Assuming, at least 3 cities exist whose names start with “H”. 9. Enter 1 character in the autosuggest field for which values are present in the auto suggest list. Then, replace it with another character for which values are present. 10. Enter 1 character in the autosuggest field for which values are present in the autosuggest list. Then, replace it with another character for which values are not present. Eg. Assuming cities starting with letter ‘s’ exist in the test list, and there are no city names that start with “x” in the list. 11. Enter 2 letters such that city names starting with 1st letter exist, but city names starting with the 2 letter combination don’t. For eg., we have cities that have names starting with “s”. But, there is no city name that starts with “sd”. Enter “sd”, and check the displayed suggestions. 12. Enter 2 letters such that city names starting with 2nd letter exist, but city names starting with the 2 letter combination don’t. For eg., we have cities that have names starting with “d”. But, there is no city name that starts with “kd”. Enter “kd”, and check the displayed suggestions. 16. Verify that user is able to select any value from autosuggest list after entering a 2 letter combination. Assuming, at least 3 cities exist whose names start with “Hu”. 17. Enter 2nd,3rd, 4th char (and so on..), and verify the values displayed in the autosuggest list. >> The input string should be highlighted in the records that are displayed in the suggestion list. >> If we have a city “Ahmedabad” in our list, and there is no other record that starts with the string “Ahmedabad”. When we enter “Ahmedabad” as our input, only one suggestion of the city should be displayed (duplicates should not be present, and full name should narrow down the suggestion list). >> Suggestion list should not display more than 10 cities. 19.Enter first character as special character and verify the autosuggest list. Eg. Assuming cities starting with letter ‘s’ exist in the test list. 20. Enter a city name that contains a special character. Check for all possible special characters. 21. Check what happens when you enter names with non-english special characters. >> Confirm requirements. If city is mandatory, user should be displayed an error, otherwise, results should be displayed according to default. Eg. 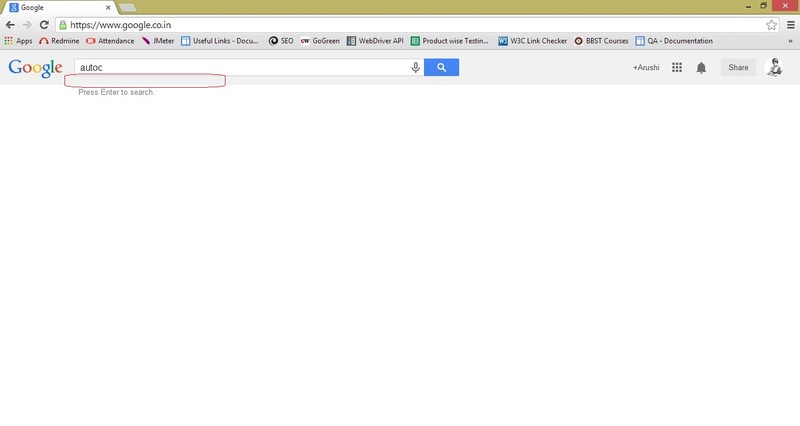 Enter a full city name like “New Delhi”, and hit enter key or click search icon. Eg. Assuming “Paris” is not in our list, and hence will not be displayed as a suggestion in any case. Enter “Paris”, and hit enter key or click search icon. 25. Check scenario where a city name contains more than 1 word. Enter “New” and check auto suggest list. Enter “Delhi” and check auto suggest list. >> If users are likely to enter a word other than the first for the city name, entering the contained words (other than 1st word) should also display the city name in suggestions. 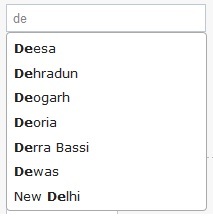 As in India, people are as likely to call the city “Delhi” as they are to call it “New Delhi”, the suggestion list should display “New Delhi” when either of the “New” or “Delhi” is typed by the user. Enter a space character (” “), and then enter “s”. >> Preceding space character should be ignored, and suggestions should be displayed to you for city names that start with “s”. Enter “s”, and then enter a space character (” “). >> Succeeding space character should be ignored, and suggestions should be displayed to you for city names that start with “s”. 28. Check handling of input to be entered that can be called by different names (different spellings). Eg. In our example of city names, a city can have an old name, and a new name. The name of a city called “Baroda” was changed “Vadodara”. A user is likely to type in any of the two names. >> Confirm requirement on whether the user should be displayed the new name in suggestion list when typing old name, or whether both the names are to be treated as independant & separate records. 29. Enter some characters, select a value from the auto suggest list, delete the value from the text box, then enter a different input and select from auto suggest list. Eg. Assuming “Mumbai” and “Chandigarh” are in the test list. >> Confirm requirements on the sorting order of values to be displayed from across categories. 33. Check widening of suggestion list when characters are removed from input field. Eg. Assuming there are 11 cities with names starting with “ha” in our database, and there are 6 cities with names starting with “hal” in our database. Enter “HA”. Enter “L”. Remove “L”. >> When “L” is removed to make the input “HA” again, suggestion list should be updated to display the same 10 cities that were being displayed earlier (before typing “L”). Eg. Assuming city “Pune” is present in our database, and the page containing the auto suggest functionality input box also has the text “Pune” written somewhere in it.